Evie is out of options. She must comply with the Affinity Project – obey their rules, play their deadly games, give up Jamie. And her losses keep growing. 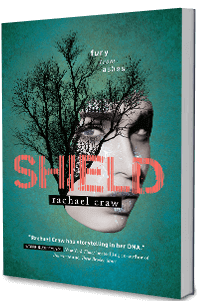 "I love that this book spits out bookmarks mercilessly ... it is a story that sets off running, and doesn't take breaks ... Shield has left me excited." Angela Armstrong, author of the Gen2K series and reviewer at Striking Keys book blog. "The scenes unfold like an action packed screen play ... A fantastic conclusion. Highly recommended." Phillip W Simpson, author of the Rapture Trilogy and Minotaur. "Rachael Craw is a class act; creating storylines with immense suspense, action-packed scenes and sentences which evoke every human emotion. Her characters have so much depth, and you can't help but be drawn into their complex web of dilemmas, following their paths with bated breath." "Shield is the perfect ending to this amazingly unique and intriguing world. There is heartbreak, joy, fear, betrayal and perseverance. Everyone has something to gain or lose - freewill."